Do Minor Parties Employ Models? Many of the activities parties would have done in-house during a campaign in bygone times have now been outsourced to agencies. This was nicely illustrated last week by a mildly embarrassing incident: The liberal FDP and the right-wing extremist NPD were using the same stock video footage of a happy family. So was a Finnish dairy company. But some of the smaller parties still put people on their posters who are most probably not professional models. Today’s exhibit is widely deployed by the Pirate party. The caption reads (in my clunky translation) “Not for sale. Just eligible”. The latter does clearly not apply to the two youngsters. But if their elderly companion was a real candidate, shouldn’t they put her name on the poster? So: Are these real rank-and-file party members, or is this another stock photo otherwise used for … whatever? If I remember correctly, all people on the posters for the 2011 Berlin campaign were candidates at least on the district level. There is a service group for creating campaign material, whose main photographer takes free pictures of party members at the national conventions ( http://bartjez.cc/photos/ ), if they agree to put the pictures under a CC license. The pictures are then used by the party in campaign material, ideally after asking the person in question if they want to appear on it. Some pictures are also the result of dedicated photo shoots, but those also involve members rather than professional models, as far as I know. The poster shows two Pirate Party members from Würzburg and their mother/grandmother, who is not a member. None of them are running for parliament. I think the message about eligibility is focussed on the party in its entirety, not individual candidates. Thanks! Is that a general policy, i.e. are all people on the posters real party members/relatives? 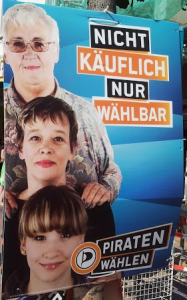 The campaign shows real members of the pirate party. The campaign itself was completely organized by the party in a bottom-up approach. However, there is a tendency in the party to focus on topics rather than heads, that’s why it does not matter who runs. The person voted into parliament is supposed to be a proxy for the people. How about “Can’t be bought. Can be chosen”? I must admit I really like their posters.